Steven (Chicagoland, United States) on 15 August 2018 in Plant & Nature and Portfolio. Guzmania (tufted airplant) is a genus of over 120 species of flowering plants in the botanical family Bromeliaceae, subfamily Tillandsioideae. They are mainly stemless, evergreen, epiphytic perennials native to Florida, the West Indies, southern Mexico, Central America, and northern and western South America. They are found at altitudes of up to 3,500 m (11,483 ft) in the Andean rainforests. The genus is named after Spanish pharmacist and naturalist, Anastasio Guzman. Several species of this genus are cultivated as indoor and outdoor garden plants. 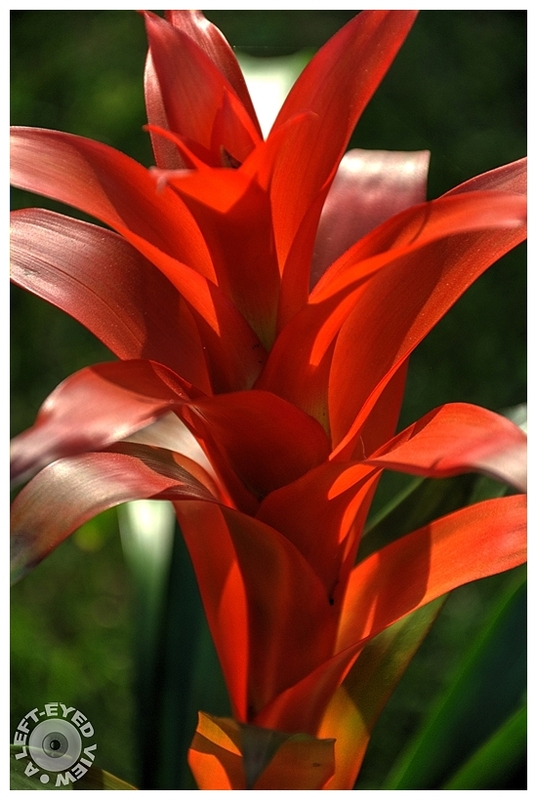 The best known is Guzmania lingulata (scarlet star) which bears orange and red bracts. The plant dies after it has produced its flowers in summer, but new plants can easily be propagated from the offsets which appear as the parent plant dies. They are epiphytes and can do well if tied on to pieces of bark with roots bound into sphagnum moss. Guzmanias require warm temperatures and relatively high humidity. I loved the backlighting seen here in the early afternoon. This bromeliad has been doing quite well in our three seasons room. See the plan view of the bromeliad that I posted HERE. Photo captured August 2, 2018. A fabulous image with excellent vibrant color. What a gorgeous specimen, Steven! Very beautiful. Strong orange, almost red is fanttastic color. Excellente capture des couleurs. Superbe. Une plante que j'aime beaucoup ! Wow.. I love the contrast between Red and Green !! Absolutely. This light is great! An excellent close up of this blossom. Very successful. Wow Fabulous !!! What gorgeous light here !!! The red is really showy. Gorgeous light on this pretty plant. Excellent shot and interesting info. Absolutely beautiful. It has such an amazing color! A gorgeous image and very interesting information. Great work, photographically and the text. Beautifully shot - love that rich color!